Unwind in the Hilton Beijing hotel's 3rd-floor Executive Lounge in the Executive Tower. Do business in one of 12 meeting rooms or the fully equipped business centre or log onto the free wireless internet access in public areas. The hotel is located in the business district, just 20 minutes from the airport and Beijing's attractions.Dine in one of 5 restaurants and bars. Enjoy Asian flavors at the Hilton Beijing hotel's 24-hour Elements restaurant, specialty coffees at Caff ino and creative cocktails at Zeta Bar.Play squash or tennis, keep fit in the fully equipped gym or drift away with a relaxing sauna and massage at the Hilton Beijing hotel. Discover Beijing attractions from the iconic Tian'anmen Square and red-walled Forbidden City to the Summer Palace's solace.Located in Chaoyang business district, Hilton Beijing hotel has 12 meeting rooms, an Executive Lounge, Business Lounge, business center and wireless internet access in public areas. Stay in a Deluxe Room or a light Executive Room with Executive Lounge access. 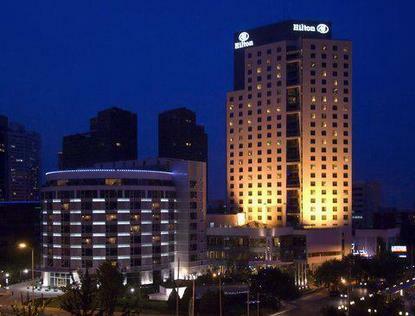 All rooms in the Hilton Beijing hotel have high-speed internet access.